Today was a leisure day. Since shops don’t open until 10am, we got to sleep in a bit today. I’ve spent the last few days hopping in and out of every artist studio I passed, looking for just the right representation of this lovely city. I finally settled with the beautiful oil paintings of the very talented Stephen Kasun. 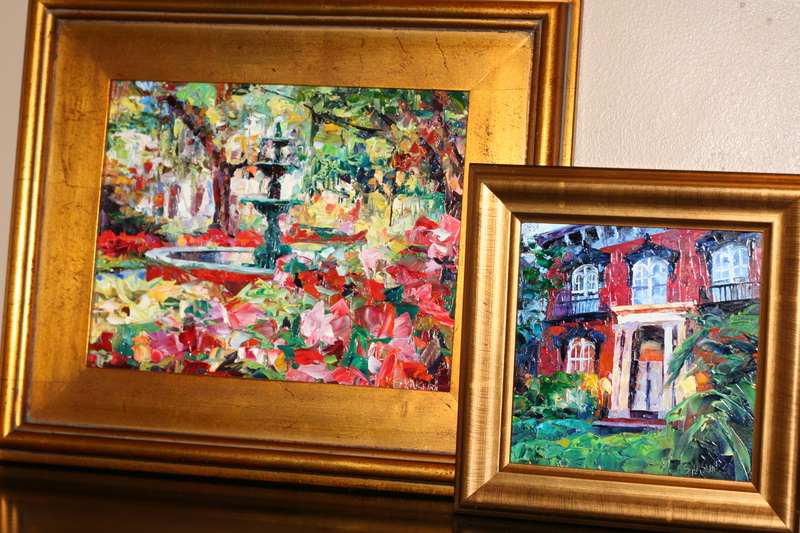 I purchased paintings of my two favorite places in Savannah, Mercer House and Lafayette Square. We spent the morning stimulating the Savannah economy at the Savannah Bee Company, Paula Dean’s shop and The Savannah Tea Room. We had a retro lunch at Leopold’s Ice Cream shop. Egg Salad Sandwiches and Tutti Fruitti Ice Cream. At 3:00 we headed down to the river front for a river boat cruise on the Savannah River. Very relaxing. We relaxed in the park until dinner time when we headed to The Olde Pink House. This Georgian mansion was built in 1789 for James Habersham Jr., one of Savannah’s most important early cotton factors. Savannah’s Olde Pink House was so named for the beautiful shade of “pink” stucco, which covers its old brick. Mom had the Pork tenderloin with bourbon molasses sauce, sweet potatoes and collard greens. I had duck in blackberry sauce with crepe wrapped veggies and fresh fruit. This was an outstanding meal! Love the paintings, especially the Mercer House. I am in awe that you stopped at Paula Dean’s shop. Roger and I have to get to Savannah. Sigh,,, happy stuff.